Don't be fooled by the drab exterior. 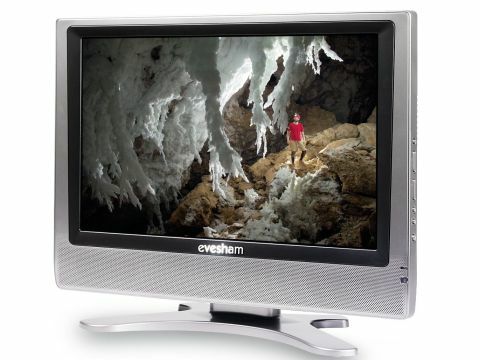 While large plasma TVs are struggling to fit more than 1,000 lines of pixels into their screens, Evesham's V20KCDX TV crams in 1,050 even though its screen is just 20-inch. What's more, while 1,000 line-plus plasma TVs cost crazy money, the V20KCDX costs just £350 - even though it's also HD Ready. In earning its HD Ready wings, though, the V20KCDX outclasses most 20-inch LCD rivals by sporting HD-capable HDCP-enabled DVI and component video jacks. Our review sample wouldn't sync properly with a Sky HD box's HDMI output, but Evesham assures us this situation has been solved by a firmware update. The set also sports a Scart, a D-Sub PC input (so the screen can double as a computer monitor), and the customary S-video and composite video options. It's hardly surprising after all this to find that the TV's onscreen menus are largely feature free. In fact, aside from a backlight level adjuster, there's little to report. Testing the V20KCDX with Alien from upscaled PAL DVD and native 1080i HD DVHS, the TV delivers a very respectable picture performance. Especially remarkable are its black levels. As the crew explore the crashed alien ship, the dark interior walls only marginally suffer from the greyness that characterises the smaller end of the LCD world. Also a revelation for a 20in TV is its fine detail response. Every glistening droplet of water, for instance, is scintillatingly visible in the moist rooms explored by Brett during his ill-fated search for Jones the cat. In fact, we'd say the V20KCDX delivers the most textured HD picture yet seen below 26in. With colours, while fleshtones can look a touch over-red and dark areas a touch green, the problems are nothing like as bad as is common at this size point. Fast moving scenes remain almost free of LCD's motion smearing issues - and this is also true during standard definition viewing, which in general looks natural. Negative points find black levels less profound and noise levels higher via the DVI jack than the component; traces of backlight spillage; and high definition widescreen anamorphic pictures seemingly fractionally stretched vertically, perhaps thanks to the panel's curious native resolution of 1,680 x 1,050. On the audio front, the V20KCDX is pretty average. There's practically no bass, which leaves action scenes sounding harsh and thin. That said, voices are generally clear, and the speakers can go loud without seriously distorting. Even its minor picture and more serious audio shortcomings don't stop us having a soft spot for the V20KCDX, though. After all, its performance actually stands up very well against many similar-sized rivals, and certainly makes the £350 price tag seem seriously tempting.